Cotttage à la campagne escapade romantique! Seulement 30 min. de Waterton !! 2 pièces, vintage inspiré, Chalet situé dans le pays w / une vue imprenable. Ce magnifique chalet peut accueillir 4-5 et est complètement autonome. Il est situé à seulement 30 minutes du parc national de Waterton. A une vue imprenable sur les montagnes et les prairies, et se trouve dans le pays sur 106 hectares! Chaque bout de ce chalet de 250 mètres carrés a été professionnellement et joliment décoré dans un thème d’inspiration vintage. La faune naturelle que vous pouvez voir à l’extérieur de votre fenêtre comprend: le cerf, l’antilope, le bison, la vache et les chevaux. Vous aurez peut-être aussi la chance de voir des canards, des lamas et des porcs dans la ferme familiale voisine. Il y a deux chambres, chacune avec un lit queen ainsi qu'un futon double dans le salon. Le pont environnant est un endroit idéal pour pique-niquer et comprend une table, des chaises et un barbecue. Les froides soirées d’hiver sont parfaites pour s’asseoir devant la belle cheminée avec un verre de chocolat chaud ou un bon livre. Vous voudrez peut-être aussi faire de longues promenades dans la campagne environnante et simplement profiter du magnifique spectacle nocturne d'étoiles et de planètes! Salle de bains de style vintage belle avec des serviettes blanches et moelleuses et des quantités infinies d'eau chaude! Comfortable space and beds, hosts were very responsive, beautiful sunsets, enjoyed the stay. Lovely cottage in a peaceful setting. We stayed here during a visit to Waterton Lakes Park and enjoyed our stay. My teenage daughter just loved the decor. She wants to decorate her house the same way. There was a window air conditioner which I wasn't aware of. That helped as it was fairly warm during our stay. Cottage had everything we needed. Had a great time. Very clean and comfortable. Remote location away from the crowds. If you are searching for solitude this is a great place. This charming cottage provided the perfect place for us to rest and refresh ourselves. It wasn't fancy but had everything we needed, both indoors and out. The decor was current and delightful, the views were spectacular, the amenities guaranteed that our stay was wonderful. We loved exploring this little corner of Alberta and took many day trips, coming back each time to this darling little nest. We will book this again and again. I live in the city and was looking for a place to go and relax with my family. 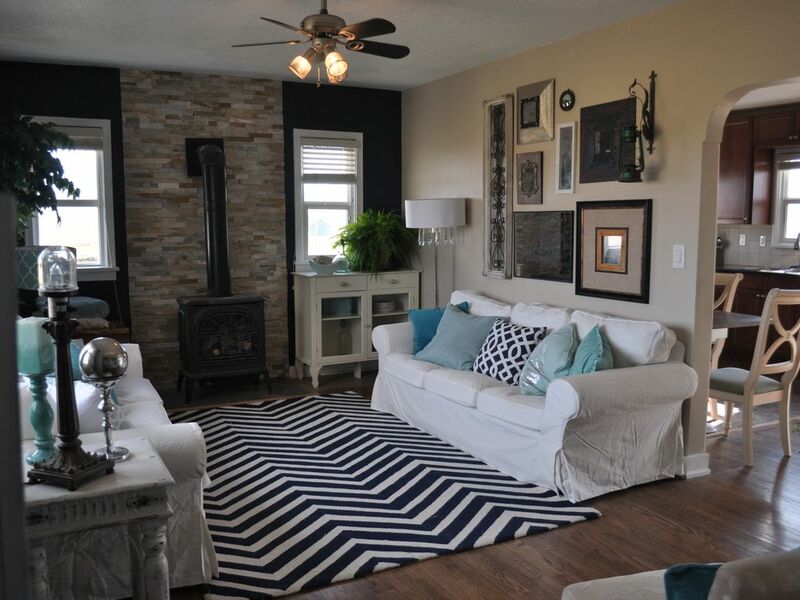 I absolutely loved this cottage and have in fact rented in more than once. It was perfect for my couples retreat, as well as my 'girls retreat'! It was close enough to Waterton for day excursions and also close to Cardston for evening entertainment and reasonably priced groceries. I loved how it is located off a main highway, but far enough away that I could not hear any traffic (which is what I was looking for) and completely surrounded by farmers fields with the most amazing mountain views. I loved the decorations. I have stayed in many nice hotels, but they just aren't charming. This cottage is completely charming. As soon as you walk in you feel spoiled by the soft blankets, perfect beds, cozy fireplace and chic decor. Rebecca was an excellent host. I had a few special needs that are unique to me and she was happy to help fulfil them. Property is For Sale, owners moved to another country four months ago. Home has been neglected, siding off exterior, door knobs falling off, grass a foot high. Inside was disgusting, dead flies on windowsills, and overhead light fixtures, thick dust on fake trees in house and jar lids on shelves. Even after sending pictures to the owner she said I was wrong, that a professional cleaning crew had deep cleaned the house twice that month. Read review from Aug 12th. We booked this rental 6 months in advance for the amenities we needed, internet, washer/dryer, and AC. Internet: We were given the wrong password, with the 16 hr time difference we were back and forth for 1 1/2 days before we got connected. Dryer: Sign on dryer said Out of Order, but owner now claims it is slow to dry clothes? Says my fault for not trying to use it! AC: The AC was a tiny window unit in living room, after running it for hours, bedroom temp at 10:00pm was 83. At check out guests are required to empty trash and sweep. When I mentioned there was food and dirt behind trashcan owner said I was weird for sweeping there. The towers across the road have strobe lights flashing every 5 seconds lighting the bedroom all night. The owners don't care about their guests, if there's a complaint they will argue that you are wrong. Owners have lied and changed their story over and over. These are not honest people. DON'T BOOK THIS RENTAL! The home was immaculate when you arrived, having just been cleaned by a professional cleaning team. But even so I offered to refund your cleaning fee. You took the refund, stayed the entire time, and then requested a full refund for your entire stay. You refused to allow my manager who lives onsite to come in and resolve concerns. There is a cell tower 7km away which has a small light on the top of it. Blinds are available on every window and can be used to stop unwelcome light. It does get hot in Alberta, which is why we have a ceiling fan in each room of the house as well as the air conditioning unit. It is unfortunate that you incorrectly spelled the Internet password that I sent you and had a difficult time connecting to the Internet. It is true I was temporarily out of the country, doing some humanitarian service. The time difference made it several hours before I was able to help you communicate with you. I have a manager with a cell phone nearby who is on call and ready to help in such situations although it does require the guest to phone the posted number. The grass gets cut each week on a schedule by our groundskeeper and was cut 5 days prior to your stay and the day after your stay. Professional cleaning companies take care of our cleaning and give excellent service. Notre chalet belle escamotable est situé dans le pays et se trouve à proximité des nombreuses attractions du parc national de Waterton. Tout au long de l'hiver et l'été il ya de nombreuses activités familiales pour participer il. Les attractions touristiques telles que la plus grande collection de transport en Amérique du Nord, ainsi que le beau temple de LDS sont tous à quelques minutes. Randonnée pédestre, natation, vélo, faire du ski, salle, la chasse et observation de la faune peuvent tous être une partie de votre expérience de vacances très agréable!